Our bones and teeth are made up of a complicated structure of organic and inorganic materials. The large surface area of these materials in the body provide a key pathway for adsorption of beneficial and harmful ions in our body. Understanding exactly how these atomic impurities are incorporated into the structure of bones and teeth, and how they affect the strength, toughness, and other properties, is key to developing ways to maximize the benefits and minimize the harm. Atom probe tomography allows atomic-scale analysis of these impurities in the surrounding matrix in 3D providing unique insights into the arrangement of the atoms. Chitons are marine mollusks with teeth that are among the hardest of any animal as their diet consists of rocks. SEM-EDS maps (center image) reveal a core of hydroxyapatite [Ca5(PO4)3(OH)] enveloped by a magnetite cap [Fe3O4]. 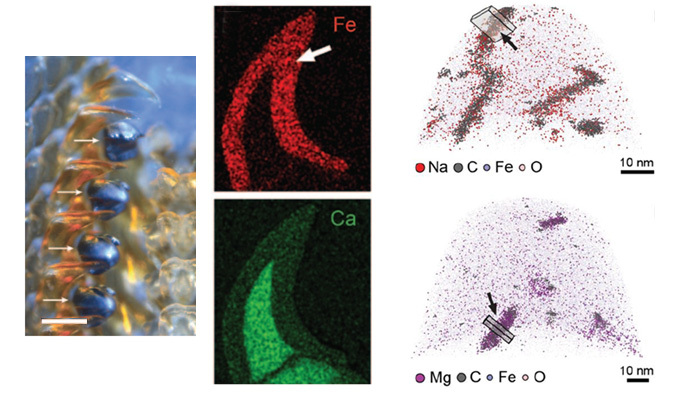 Further analysis from within the magnetite cap reveals a novel structure. Embedded within the magnetite are organic nanofibers. A variety of nanofibers are present, some of which incorporate Na and others which incorporate Mg. The complicated shapes and distributions of these fibers and the organic/inorganic interfaces can be analyzed in 3D through atom probe tomography to help us understand these biominerals and the source of their novel properties. Joester, D., A. C. Hillier, Y. Zhang, and T. J. Prosa (2012), Organic Materials and Organic/Inorganic Heterostructures in Atom Probe Tomography, Microscopy today, May, 26–31.